Watch this professional dumpling chef make siu mai. He applies the filling as if it’s a spread so that it will stick to the wrapper and minimize air bubbles (which cause the wrapper to fall away from the filling). He rotates the siu mai in his hands as he uses the blade of his spreader to add more filling and to compact it into the wrapper. ‘Team Dumpling’ was a group of 10 who worked with me to make about 100 dumplings in just 2 hours for the 60+ attendees of the Professional Development Day at Stephanie Alexander’s Kitchen Garden Foundation. 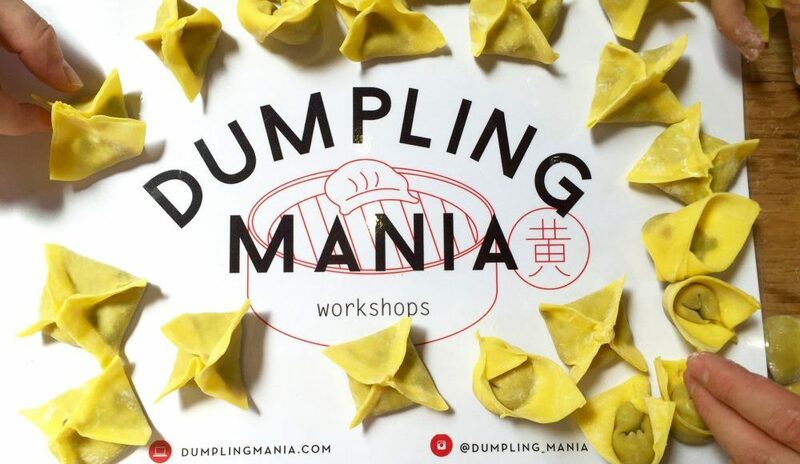 Stay calm & make dumplings! 1 Combine all of the seasonings and blend with chopsticks or spatula or wooden spoon, or blend by hand. 2. Add pork mince and jicama and blend by hand, in one direction only. Scoop the mixture with your hands so that you are blending but not ‘squishing’ it all together. Do this gently until the mince and jicama have blended in with the seasonings. (Blending in one direction prevents the meat from becoming ‘mashed’; the filling needs to retain texture). Sprinkle the corn flour into the mixture and continue to blend by hand until the corn flour is absorbed. 3. Transfer to 4 or so smaller bowls, cover and refrigerate for an hour. Take out one bowl at a time as you wrap the wonton. 4. To cook the wonton bring a pot of water to boil. There should be enough water so that the wonton can float about. Drop the wonton into the boiling water and partially cover the pot. When the wonton as risen to the surface, give them another 2 minutes and then drain. Wonton & Soup: for a meal, 7-10 wonton per serving; place drained wonton into individual soup bowls or one large bowl. Immediately, add soup stock (Chicken stock or use miso paste to make a soup) and vegetables such as bok choy, snow peas, broccoli, Chinese cabbage, shiitake or enoki mushrooms. Optional: slices of lemon and fresh minced chili on the side. Wonton with chili: as a shared platter, place about 4 wonton per person on a large platter. When you spoon the wonton onto the platter, include a little bit of the water in which the wonton were boiled as this will prevent the wonton from sticking to the plate. Sprinkle with Sichuan pepper and drizzle with chili oil. Add slivers of snow peas (1 per every 4 wonton – cut into lengthwise thin slivers and blanch for 30 seconds, drain) and garnish with sprigs of coriander. Sprinkle corn flour on to a tray or plate. Place the finished wonton on the tray or plate so they are not touching and place into the freezer – do not cover. When they have frozen hard, remove form the plate/tray and place into freezer bags or boxes. These can be stored for up to 3 months. To cook frozen wonton, they can go straight from the freezer to the boiling pot. When they have risen to the surface, give them another 3 minutes and drain. * Jicama – refers to the crunchy root of this plant. It is best to chop it finely by hand as it is to add texture and ‘crunch’ to the wonton. Do not mince it using a food processor as this will turn it into an undesirable mushy mass. I add it to wonton/dumpling fillings as a substitute for water chestnuts. Click here for the wikipedia entry about jicama. It add texture as it is slightly crunchy and has a light, slightly sweet flavor. I use a Japanese mandolin to cut it into sticks, then chop those sticks into little cubes. In Melbourne, it is available from Chef’s Hat, across the street from the South Melbourne Market on Coventry Street. (note: the Japanese mandolin is not shown on their website but I have seen stacks of them for sale there).